Can Anyone Claim this Silver Medal for Tricycling 100 Miles? Alex Gemmell has asked our visitors if you can tell us more about this silver tricycle medal awarded by Maybole Cycling Club for tricycling for 100 miles. The medal was awarded to W. McKellar and has the Birmingham Assay Office Anchor stamp. 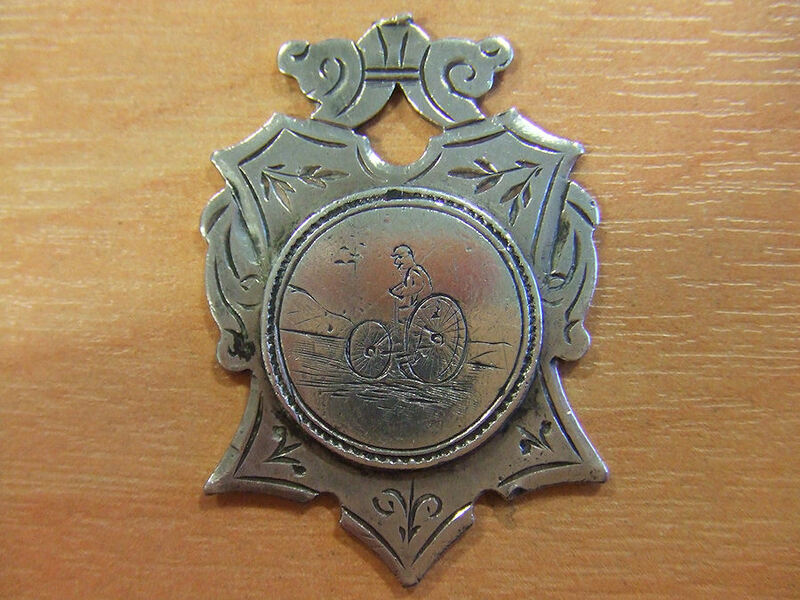 This medal was made by John Gilbert in Birmingham, and bears the hallmark for 1890. Alec is willing to give the medal to the 'owner' or surviving relatives if we can trace them. Click on the images above to view full size. The message above was posted on this website early in 2011. In October of this year we received the message below! In January of 2012 we received another addition to the story ! 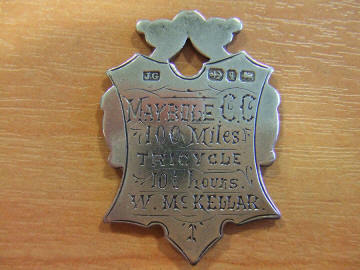 I am trying to contact Alex Gemmell regarding a posting on the maybole.org website about a tricycle medal. My great grandfather was William McKellar and I believe this medal belonged to him. In addition, I have another (what I think is a Gold version of the same medal as it is marked 9ct on the back) that is in his name (photos to the right.) I am hoping someone can help us with getting more information about the medal and what year it might be from. Of course we replied and are very happy to have found a connection and the rest of the story below! Thank you for your response! My great grandfather is the one that married Isabella Lees (who was the daughter of John Lees who founded the John Lees & Co Ltd boot factory in 1874 in Maybole.) William McKellar went on to run the boot factory with Isabella's brother John Lees after the senior John Lees passed. 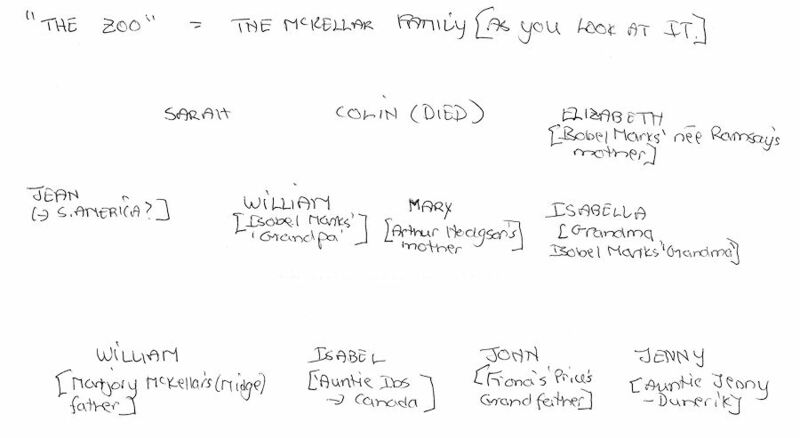 of the 9 children was my grandfather John McKellar who went on to run the factory after William passed. I found information about the boot factory on the website about three years ago. At that time my mother was still alive and I was able to share it with her as she had some interesting memories of growing up in Maybole. 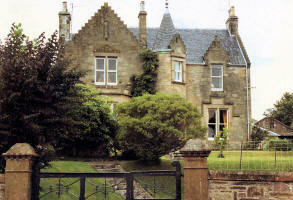 William and Isabella McKellar orignally resided in Maybole at 3 and 4 Barns Terrace. 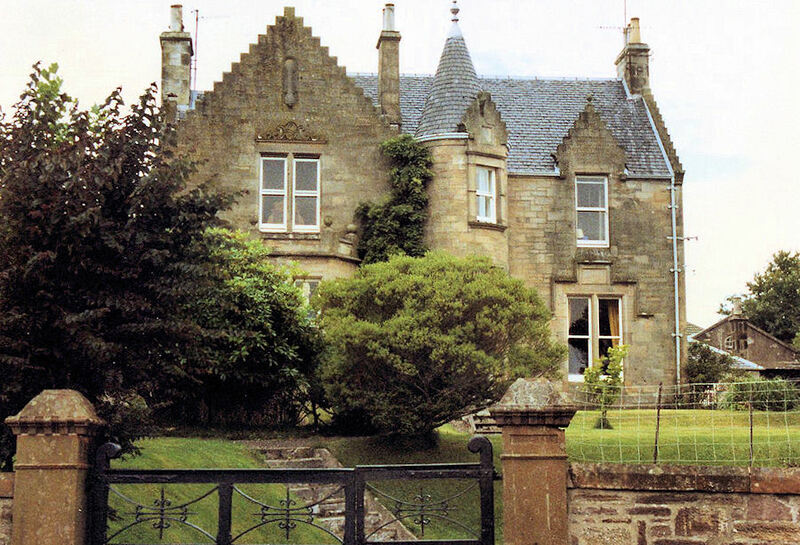 Later (and I'm still working on when they moved) they resided at Kincraig (photo on the left of Kincraig taken when I was visiting Maybole in 1987) which is I believe is at Culzean Road and Cargill Road. 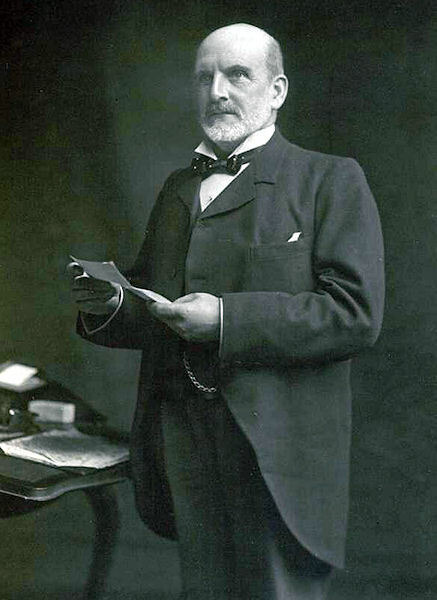 William McKellar was born in 1852 and was the son of Colin and Sarah McKellar. I believe his mother, Sarah McKellar along with her son William, daughter Mary, and grandson Colin Thomson moved to Maybole from Kirfieldbank sometime between 1871 and 1881 (according to the 1871 and 1881 census.) 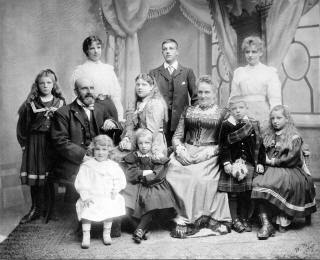 The 1881 census had the the four of them living at Redbrae in Maybole and William's occupation at that time was listed as "currier." William McKellar between 1881 and early 1883 married Isabel Lees (daughter of John Lees.) The 1881 census lists that Isabel, at age 20, was living in Maybole on Back Road. Her father John Lees' occupation was listed as "Tea Merchant" even though I believe at that time the shoe factory had been started? (I am have not seen the census report yet for 1891 to see what the occupation for John Lees and William McKellar was at that point.) William McKellar was also Provost of Maybole from 1905-1912. The photo is hanging in the Maybole council chamber. Sarah (Sadie) Thomson McKellar 1884 - ? Mary McKellar 1888 - ? William Thomson McKellar 1897 - ? 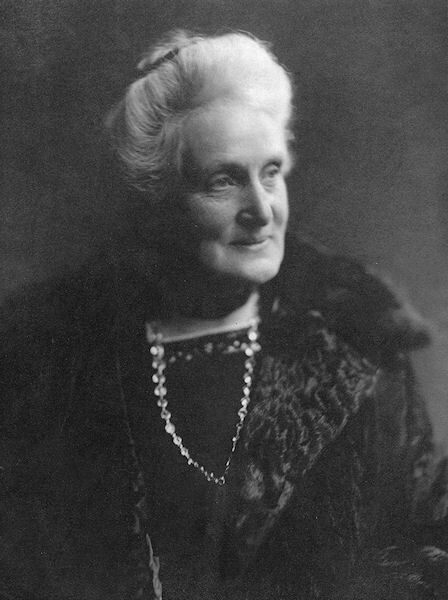 My mother (Elizabeth Watson McKellar Anders) had memories of her family (John McKellar - son of William and Isabella who went on to run the John Lees Ltd. Shoe Factory.) living in the Carrick House and visiting her grandmother (Isabella McKellar) who lived at Kincraig at that time. I believe William McKellar passed away in 1924. 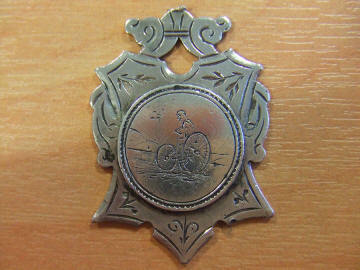 I would like to know more about the Tricycle Medal and why there are two!. My sisters (Fiona Price and Jeannette Anders) and I are very excited about finding the connections to Maybole and the cycling medal! Photo of W.T. 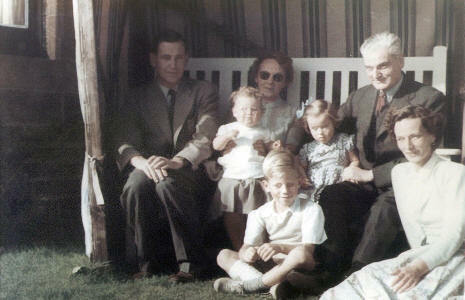 McKellar and family members taken at Delcombe in the 50's. From right to left, looking at the photo - my mother Marcia, grandpa, my sisters Ann and Pam and me, grandma (we are not sure of her name as she was always referred to as Maybole granny) and my father John (Iain) Lockhart. Tankard inscribed " Presented to W. T. Mckellar by the officers of "E" Company 6th Battalion Ayr Home Guard 1940- 1944"
I read with interest Ms. Novzen's post on the McKellar family and the tricycle medal. W.T. McKellar, youngest son of the tricyclist, who is shown in the picture in the front row, was my grandfather and, when I knew him in the 50's until his death in the 60's, lived in Delcombe on the Culzean Road. I think I remember in the 50's being taken to Kincraig or a house nearby to meet a formidable "great aunt". Grandpa lost a leg in WW1 and the other was permanently stiff. He told us that he had lost it in "the last cavalry charge of the war". We think he was in Nottingham at some time but moved back to Maybole after the war and worked for John Lees. He drove to work every day in a specially adapted car - unusual for those days! In the second world war he was in the Home Guard and I have a tankard inscribed " Presented to W. T. Mckellar by the officers of "E" Company 6th Battalion Ayr Home Guard 1940- 1944"
On the photograph that he is named as "father of Midge". In fact he had three daughters - Marcia (my mother), Isobelle and Midge. I attach a copy of a photograph (shown above) taken at Delcombe in the 50's. From right to left, looking at the photo - my mother Marcia, grandpa, my sisters Ann and Pam and me, grandma (we are not sure of her name as she was always referred to as Maybole granny) and my father John (Iain) Lockhart. I think my aunt Isobelle kept in touch with second cousins in Canada and I think we have second cousins in Argentina. One of my cousins still lives near Maybole."